The Royal Oak and the Swan Inn are the nearest places to eat in Kington (about 5 minutes walk down the hill from our house). The Oxford Arms is the largest of the town-centre pubs. Pub food available most days. The landlord is a keen and knowledgable beer enthusiast, so there is always a good range of local real ales to be found here. The Burton Hotel in Mill Street, Kington is the principal hotel in town. It contains a health club, with a swimming pool, and a sauna and gym, providing a valuable new facility for visitors as well as for residents. Ask the hotel for further details. The Taj Mahal, in Bridge Street, is Kington’s curry house, and is open every day of the week except Tuesday. We are fortunate to have these delightful chaps offering us bumpkins such delicious and exotic food, at modest prices. They don’t have a licence to sell alcohol, so pick up a few cold beers at the Spar shop on your way down to the restaurant. Tel. 01544 – 231999. The Stagg Inn at Titley (about 3 miles from here) has, ever since Steve and Nicola Reynolds opened it, been easily the best place to eat around here. 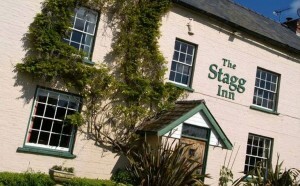 In 2001, the Stagg was awarded a Michelin star, the first one ever for a pub. People come from far and wide to eat at the Stagg Inn, so you are advised to book your place well in advance if you wish to eat there at a weekend. The Harp Inn Old Radnor – an unassuming country pub with spectacular views from the lawn. Best place for many miles from which to enjoy the sunset on a fine day. Good food there, but beware of slow service at the (tiny) bar. The Tram Inn Eardisley – good pub food at modest prices, attentive and friendly staff, and a healthy blend of enthusiastic local diners and drinkers combine to make this a very busy and buzzing place to go. Possibly not the best place for a quiet, romantic evening! 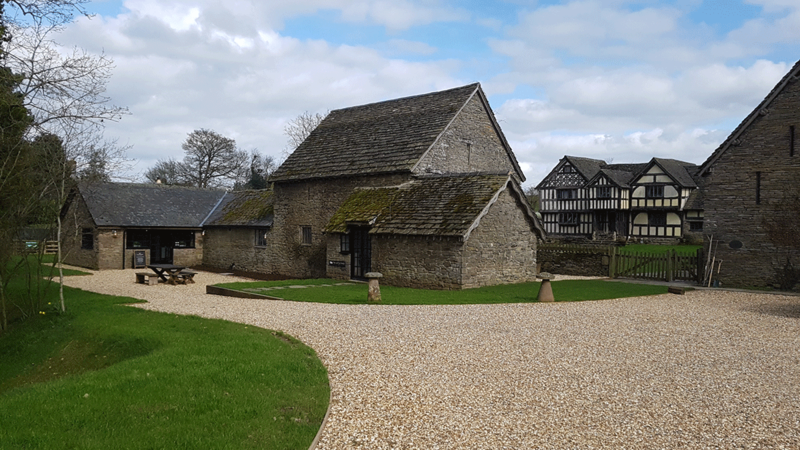 Penrhos Court A mediaeval hamlet just outside Kington, fully restored and reopened in 2018 as a place for coffee, lunch and teas. (Closes at 5pm.) All very promising; evening meals may follow before long. Worth a dabble! Tel. 01544 230007.